Globalization is a fact. You can't stop it; it has already happened; it is here to stay. And we are moving into a new global stage. A radically new world is taking shape from the ashes of yesterday's nation-based economic world. To succeed, you must act on the global stage, leveraging radically new drivers of economic power and growth. 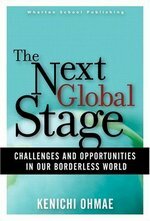 Legendary business strategist Kenichi Ohmae—who in The Borderless World, published in 1990, predicted the rise and success of globalization, coining the very word—synthesizes today's emerging trends into the first coherent view of tomorrow's global economy—and its implications for politics, business, and personal success. Ohmae explores the dynamics of the new "region state," tomorrow's most potent economic institution, and demonstrates how China is rapidly becoming the exemplar of this new economic paradigm. The Next Global Stage offers a practical blueprint for businesses, governments, and individuals who intend to thrive in this new environment. Ohmae concludes with a detailed look at strategy in an era where it's tougher to define competitors, companies, and customers than ever before. As important as Huntington's The Clash of Civilizations, as fascinating as Friedman's The Lexus and the Olive Tree, this book doesn't just explain what's already happened: It offers a roadmap for action in the world that's beginning to emerge.